Though it requires little introduction, “Angels by Raphael” is perhaps one of the most well known works of art ever produced. It is a detail from a painting in the Sistine Madonna. It shows two cherubs, one of whom is staring up and the Madonna. The other appears lost in art. In the larger work, the two cherubs are flanked by St. Sixtus and St. Barbara. 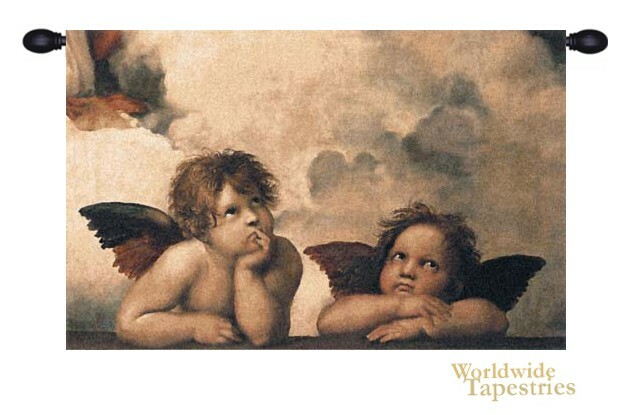 This portrayal of angels as cherubs was very popular during the Renaissance period. Despite his early death at the age of just 37, Raphael helped define the style of Renaissance painting along with Michelangelo and da Vinci. This piece captures the beauty of Raphael’s original. This tapestry is lined and has a tunnel for easy hanging. Note: tapestry rod and tassels, where pictured, are purchased separately. Dimensions: W 43" x H 27"